Public Program. Caxton Hall, London (UK), 20 May 1983. What you can do, Caxton Hall, London (UK), 26 November 1982. Let’s start! Today is a day of departure for Me, for India, and, I am very sad that I have to leave My children here. It’s a sad day, no doubt. But I have to go as you know and you all are going to join Me, quite a lot of you. A Solution to Come, Public Programme. Caxton Hall, London (UK), 16 August 1982. These days, when you read newspapers or you meet people you get the feeling that everybody is waiting for a disaster or for some sort of a solution that has to come. “You Are All Bound By One Thread”, Public Programme. Caxton Hall, London (UK), 14 June 1982. We all are expecting something great to happen and the happening that has to take place has been already described in all the scriptures. But somehow we are misled by other people who have a better way of manifesting their own style and we get so confused because this is the time of great confusion. The Dawning of Realisation. Caxton Hall, London (UK), 19 April 1982. [Last] time I talked to you about collectivity outside your own shell, how, after your Realisation, after your second birth, you become conscious that you are no more an egg but, now, you have become part and parcel of the whole. You realise it gradually. 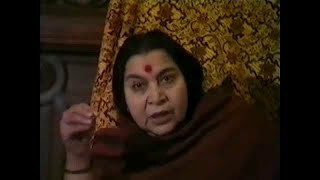 What is the need for Sahaja Yoga? Public Program. Caxton Hall, London (UK), 14 April 1982. The other day, on the radio, they asked a very nice question, which I think I should handle first. 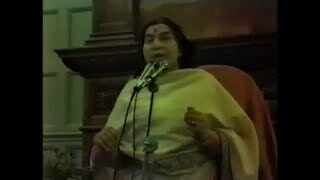 The question was ‘What is the difference between other sects and Sahaja Yoga?’ It’s a very good question because it gives you a relative idea as to what is reality, and what is not. …Divine to work out its working. Because Divine can go up to a point, that’s the trouble. It has no interest in your money, nor in your position or anything. It has only one interest: that you should take to Divine love. And if you go on accepting something that is stupid how can Divine help you? Reality is what it is, Public Programme. Caxton Hall, London (UK), 22 March 1982. It’s so beautiful to come back to London to meet all of you, again, after such a big gap, I felt. It’s a funny feeling one gets when you leave the country and you are away, and then you find other people same way when you leave them. You feel an ocean of compassion and love. The Heart of the Universe, Public Programme. Caxton Hall, London (UK), 14 September 1981. It is so heartening to see so many of Sahaj yogis seated before my eyes which are really covered with tears of joy and tremendous happiness. You have been blessed by the grace of God to become the real baptised, the real Muslim, the real Jew, the real Christian, the real Hindu. Seeking the Light, Caxton Hall, London (UK), 17 August 1981. Public Program. Caxton Hall, London (UK), 20 July 1981. There are some guests from Hong Kong now let them sit down. Sahaja Yoga is such a fantastic thing that, when people get their realisation, they can’t even believe that they have got it, first of all. Where does the Truth lie? Caxton Hall, London (UK), 6 July 1981. How many are new today? I am sure somebody must have spoken before, no? 1981-06-29, Conditioning, Caxton Hall, London (UK), 29 July 1981. The other day I talked to you about the left side power that we have by which we desire. 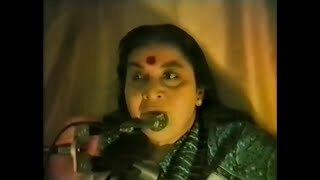 In Sahaja Yoga language we call it as Mahakali power. And this power gives us the left side which is our subconscious. And the subconscious, it gives us the conditioning. Through our subconscious only we become conditioned. Now how does our subconscious take the conditioning? “The Mystery of God”, Caxton Hall, London (UK), 8 June 1981. Christ and Forgiveness, Caxton Hall (UK), 11 May 1981. “You Are Part of the Divine Being”. Caxton Hall, London (UK), 1 December 1980. I could not accommodate all of you in my house then I thought better to come here all of you would fit here! And today is the last day for our Sahaj Yogis (before Mother’s trip to India). We have to understand certain very, very important things about ourselves and our organisation that is Divine. Are You Seekers? Caxton Hall, London (UK), 24 November 1980. …that has to be first realised – what is your category. And if you are that category, of the category which is seeking beyond what you have and that you are not satisfied with what you have already, then you are the category of seekers who have been seeking something that is very subtle, that is not gross, not intelligible through your sensory organs. The Eternal Spirit, Caxton Hall, London (UK), 10 November 1980. 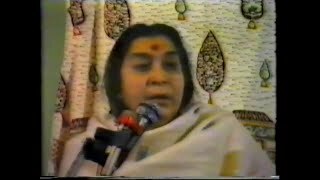 Shri Mataji: Somebody has done some introduction, has someone done? Peter? Is he there? Peter, you have to talk to these people about what I told you. “We Are All One”, Public Programme, Caxton Hall, London (UK), 3 November 1980. What do we expect from Self-realisation? Caxton Hall, London (UK), 27 October 1980. The other day I was telling you about our growth within, after Self-realisation. “The Way of Kundalini”, Caxton Hall, London (UK), 20 October 1980. This has been the month of warnings somehow, because certain things I have been seeing in people, how it happens and how people get into problems. 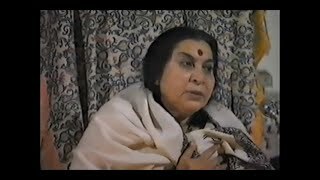 How our inner being is disturbed and why sometimes Sahaja Yoga fails within you. One must understand the dangers we face as human beings. We Have To Get Our Yoga, Caxton Hall, London (UK), 1 September 1980. Raksha Bandhan. London (UK), 26 August 1980. The Dangers of Inertia, Caxton Hall, London (UK), 18 August 1980. “The Guru Principle”, Caxton Hall, London (UK), 28 July 1980. Yesterday I told you about the Void, the dharma, which one has to establish. “Auspiciousness”, Caxton Hall, London (UK), 21 July 1980. Hello! It’s good! How are you? It’s a good day. Today is an auspicious day because 21st is an auspicious day for us and today is Monday and the 7th month. All things combined together and it’s a very auspicious evening. So today I’ll talk to you about auspiciousness because most of you are Sahaj Yogis. Who has come for the first time? Confusion, A Sign Of Modern Times, Public Program. Caxton Hall, London (GB), 14 July 1980. What is happening in other Lokas? Caxton Hall, London, England. 30 June 1980. It’s a fact. It’s a thing you can see. It’s an actualisation. And we are so much lost in our own imaginations, in our own hallucinations and misguidance, that we cannot believe that there could be something factual about God. But if God is a fact, then even this happening has to happen within us, otherwise He doesn’t exist. “The Subtlety Within”, Caxton Hall, London (UK), 9 June 1980. [The other] day in the ashram I was telling you about our subtleties, the subtleties we have already within us which we do not understand. Could be from our sub-conscious mind, could be from our supra-conscious mind, could be from anywhere that is unknown to us; but the subtleties that lead us to our universal being is the one we should bother about. Being Born Again, Public Programme. Caxton Hall, London (England), 12 May 1980. Yes, good. You may take out your cloth – it’s very warm – if you think so, or it’s all right whatever you wear. What is Second Birth? Caxton Hall, London, England. 21 April 1980. “ (…essly) and she puts another sari or a good dress and all that and then she locks up herself in the room and enjoys herself [laughter]. So it shows the essence of it is the sharing and the maximum of it should be achieved because the joy of it comes through sharing : is wisdom. The Egg and Rebirth, Caxton Hall, London (UK), 10 April 1980. “The Meaning of Reality”, Public Programme, Caxton Hall, London, England. 24 March 1980. How many of you are new people? I would like to know. So first of all I’ll have to tell you something about Sahaj Yog and also about how people get mixed up with other things. Public Program. Caxton Hall, London (UK), 13 March 1980 . 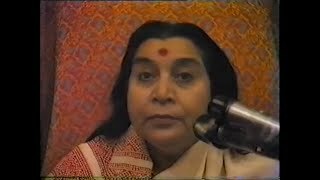 Many of you here are Sahaja Yogis, means you have known Sahaja Yoga. Also many of you are realized souls and many of you have achieved a great height within yourself. And many of you have assumed the divine grace, its working, its maneuvering and its manifestation very well. Christmas And Its Relationship To Lord Jesus, Caxton Hall, LONDON (UK), 10 December 1979. “Realisation is not of the Intellect”, Public Programme. Caxton Hall, London, England. 3 December 1979. Nice talk he gave and also I thank all of you for coming down here. Public Program. Caxton Hall, London, England. 26 November 1979. …and how it resides within us and how we are lost in the curtains of Maya. Today I am going to tell you how we get to that Spirit. “Seeking in The West”, Public program, Caxton Hall, London, England. 21 November 1979. I’m really thankful to Gavin, the way he has explained to you. His method is very meditative by which he permeates. I think he articulates better for the understanding of the Western mind. Knowledge of the Divine, Public Programme, Caxton Hall, London (UK), 28 October 1979. The Problem of Ego, Caxton Hall, London (UK) – 22 October 1979. How realisation should be allowed to develop, Public Program. Caxton Hall, London, England. 15 October 1979. Most of you are Sahaja Yogis here.